PeeGee Hydrangeas - Surfing Hydrangea Nursery, Inc.
Pee Gee Hydrangeas really come into their own on the Grey Lady this month. These beauties bloom after the mop heads and lace caps, so just as ‘Nikko Blue’ and the first flush of ‘Endless Summer’ flowers are starting to get a little peaked, the white fluffy flowers of panicle hydrangeas become a real highlight in the garden. Although native to East Asia, these plants are perfectly hardy here on Nantucket. 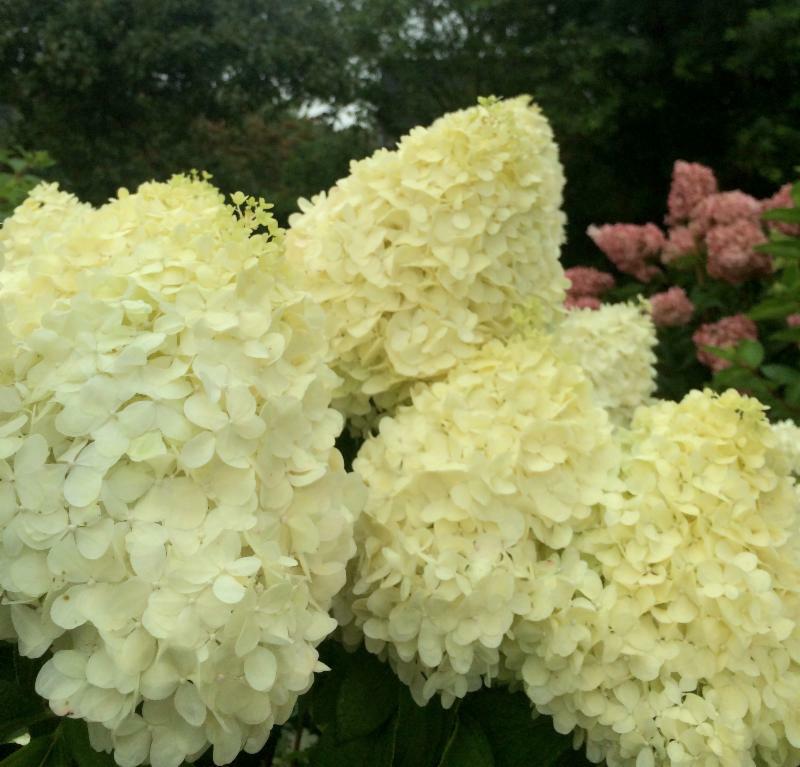 As long as they are planted in reasonably good soil with some sun, Hydrangea paniculata will perform well. However, the best specimens are grown in full sun in good, well-drained soil. Most cultivars will form a large shrub in excess of 10′ tall, if allowed. Or they can be grown as small single-stemmed trees. Unlike many other Hydrangeas, paniculatas bloom on growth from the current season. So getting bountiful blooms is almost fool-proof. Most cultivars will produce a pale green conical flower that matures to white and finally blushes pink in the fall. Many of the newer cultivars like ‘Quick Fire’ and ‘Vanilla Strawberry’ will blush pink much earlier. ‘Grandiflora’ aka ‘Minazuki’ aka ‘Pee Gee’: The granddaddy of them all. This is a Japanese cultivar introduced in 1862. The flowers are mop-type. With proper pruning and fertilization can reach 12-18″ in length and 6-12″ wide at the base! Un-pruned plants will have much smaller flowers. Available in tree form. ‘Lime Light’: A favorite, this variety produces bright green mop head flowers that mature to white, and finally blush pink in the fall. Available in tree form. ‘Little Lamb’ aka ‘Klein Schaapje’: Don’t let the name mislead you, this is not a dwarf plant! The 5-6″ mop head flowers are smaller than many other cultivars, and are reminiscent of little lambs. ‘Pink Diamond’ aka ‘Interhydia’: The large conical flowers of this cultivar are composed of both sterile and fertile showy flowers. This makes the 12″ long x 8″ wide blooms appear lacy. Available in tree form. ‘Tardiva’: Once the most widely available lacy-flowered paniculata. The flowers are 11″ or so long. Blooms later than many cultivars. Available in tree form. ‘Unique’: A lovely selection, introduced in 1968. The lacy flowers are 13″ long. This selection was a seedling of ‘Grandiflora’. As the story goes, the seedlings were uprooted by birds. The only plant they left behind was propagated and given it’s unique name. Available in tree form. There are many more cultivars widely available. Check out our pinterest page for photos of all the panicle hydrangeas we sell. Questions about pruning this type of Hydrangea??? Need a visual? Check out our Videos!